Rembrandt devoted himself to exploring the great stories of the Bible with more intensity than any other subject he treated as a printmaker. From the beginning until the end of his career, the stories of the Old and New Testament, in all their human pathos, were interpreted most imaginatively in his etchings. Using all of the technical skills at his disposal, they demonstrate Rembrandt’s supreme gift for expressive characterisations and his capacity to dramatise vividly and compellingly those scenes in which the divine touches the everyday. Christ presented to the people, also known also as the Ecce Homo (behold the man), is based mainly on the passage in St Matthew’s Gospel (27: 17–23) in which, immediately before His flagellation and crowning with thorns, Jesus is presented to the people of Jerusalem by Pontius Pilate, who asks the spectators whether he should release Barabbas or Jesus. The Roman governor Pilate, wearing a turban and holding a long staff, points to Christ, whose arms are bound. The real criminal, Barabbas, is presumably the figure with coarse features standing between them and slightly to the back. Below the platform in the palace courtyard the jeering crowd demands Barabbas’s freedom and Christ’s death; Pilate reluctantly accedes and sends Christ to be crucified. Among the mass of onlookers is Pilate’s wife who watches the event from a window in the upper left. In the darkness of the palace interior we can just make out a figure, presumably the messenger dispatched by Pilate’s wife after her prophetic dream to warn her husband not to condemn an innocent man. Meanwhile, the outcome of the narrative is indicated by the young servant on the extreme left of the platform holding the jug of water and bowl in which Pilate will innocently wash his hands of the affair. The print’s imposing architectural setting and compositional arrangement were clearly inspired by Lucas van Leyden’s engraving of the same subject from 1510. Lucas was the most esteemed Dutch engraver of the previous century and Rembrandt owned an important collection of his prints, readily using them as a point of departure for his own compositions. 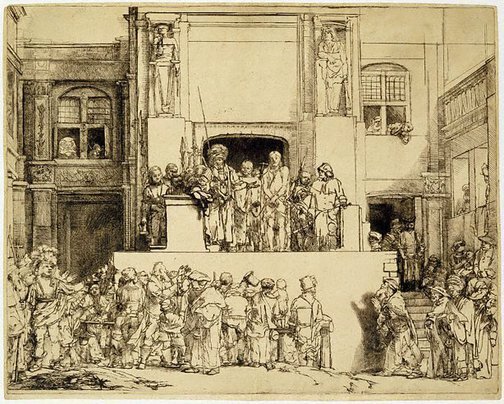 While Rembrandt followed Lucas by setting the historical drama outdoors on a raised platform with the mob below, his populace, by contrast, appears to be made up of realistically observed Amsterdam citizens of various classes. A further contemporary touch in Rembrandt’s print is the inclusion of the figures of Justice and Fortitude above the central doorway of Pilate’s palace. Statues such as these typically adorned Dutch courts and civic buildings. But despite the similarities to and departures from Lucas’s engraving, the interpretation of the drama, focused squarely on the act of judgment and its implications, is Rembrandt’s own. Like The three crosses of 1653, Christ presented to the people was conceived on a large scale, and Rembrandt may have regarded these two monumental prints – both executed entirely in drypoint – as a pair. Drypoint involves scratching the design directly into the soft copper without the mediation of an etching ground. As the needle incises the copper plate it creates burr – the tiny metal fragments that curl up on either side of the line. The burr soaks up the ink to give the printed line a rich, feathery texture, but since the burr is fragile it disappears rapidly with the pressure of repeated printing. Thus Rembrandt was encouraged – as much by practical as aesthetic considerations – to rework his plate constantly. of Christ’s vulnerability and humiliation, and so engaging and challenging the beholder anew. Art Gallery of New South Wales picturebook , Sydney, 1972, col illus p 12. Nicolas Draffin, Art Gallery of New South Wales handbook , 'Prints & Drawings', pg. 109-124, Sydney, 1988, illus p 116. Renée Free, AGNSW Collections , 'The Western Heritage, Renaissance to Twentieth Century', pg. 108-172, Sydney, 1994, col illus p 116. Bruce James, Art Gallery of New South Wales handbook , 'Western Collection: Works on Paper', pg. 78-92, Sydney, 1999, illus p 80. Peter Raissis, Look , 'Old Europe: rarely seen prints and drawings on show', pg. 23-25, Sydney, Jun 2006, p 25. Prints & drawings Europe 1500-1900 , Sydney, 2014, p 66, col illus p 67. Christopher White, Rembrandt as an etcher: a study of the artist at work , London, 1999, pp 97-104. Portrait of a Gallery , 'Prints & Drawings', pg. 115-122, Sydney, 1984, illus p 115. Australia's national collections , Sydney, 1980, illus p 254. Rembrandt’s etchings: states and values , Philadelphia, 1967, np B76, 4th.